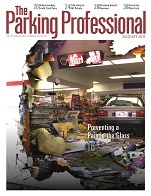 Thanks to the International Parking Institute's publications staff for making the article I wrote for the August issue of The Parking Professional their cover story! They put a catchy headline on it—“Preventing a Pain in the Glass”—and worked up an eye-grabbing cover image. The visibility helps educate a lot more people—especially those who are in a position to implement solutions. I'll be sending article reprints to a variety of stakeholders and decision makers with a letter seeking their assistance. Most IPI members and subscribers have received their hard copy of the magazine in the mail by now. The online version will no doubt appear on IPI's website—Parking.org—before long. Google's Blogger platform doesn't have a place to host the file here, so just email me (mark 'at' storefrontcrashes.com) if you'd like a PDF copy, or visit the 'samples' page of my business website (WrightsContent.com) to download the PDF (3.5MB) directly.